If you would like to read the next part in this article series please go to App-V Basics: Installing and Using the App-V 5 sequencer (Part 2). 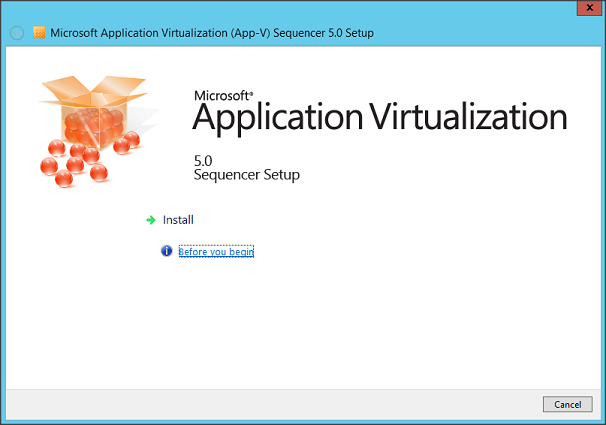 With the release of App-V 5, Microsoft made the next step in the application virtualization space. This release is a major update and complete rebuild of the product, so many components have changed. So even if you already have experience with previous versions you need to get familiar with the new/changed components of this App-V 5 version. In this article I will describe the installation of the sequencer component and the steps to create an App-V package with this sequencer component. The installation of the sequencer is delivered as a single executable. The installation can only be done on Windows 7 SP1 machine or higher. On this machine also .Net Framework 4 and PowerShell 3.0 need to be installed in advance. 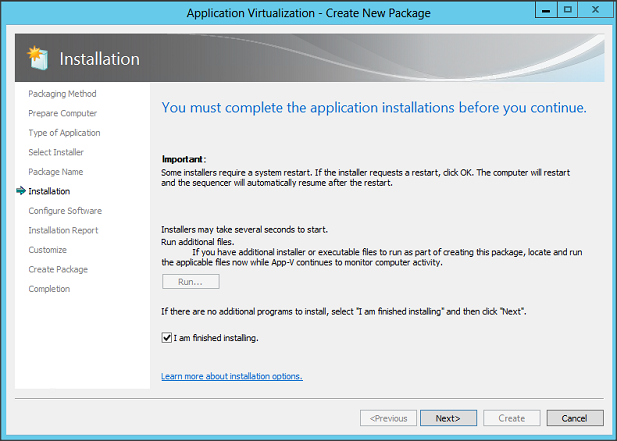 For this article I execute the installation on a Windows 2012 server, which has these components installed in advance. The installation is really straight forward and starts with an introduction screen, where you have to choose the installation options as shown in figure 1. Figure 1: The start-up screen of the App-V 5 Sequencer installation. After choosing the install button, the license terms are shown and need to be accepted by checking the “I accept the license terms” option. Figure 2: Accepting License Terms. The last question before the actual installation process is started is if you would like to join the Customer Experience Improvement Program (or not). After selecting the answer that reflects your organization's decision, the installation is started via the Install button. When the installation is finished it notifies you with a print screen as shown in figure 4. Figure 4: Sequence setup completed successfully. 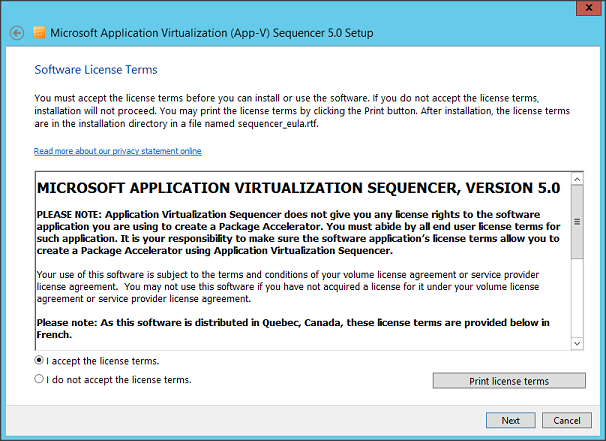 One of the best practices for App-V sequencing is to sequence as much as possible on a virtual machine. This makes it possible to create a snapshot of the current state of the virtual machine. 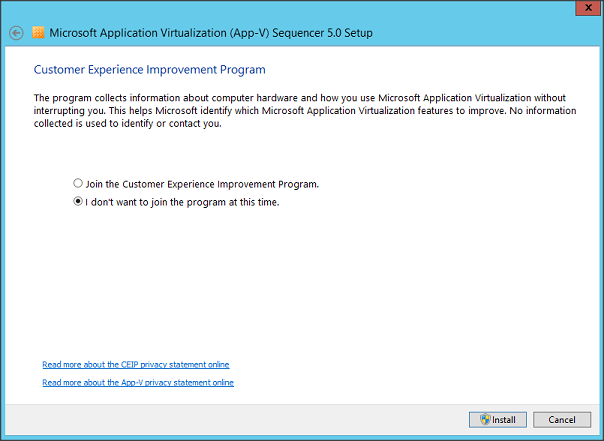 After creating a package you can revert the virtual machine back to this state and start a new sequence process. After creating the snapshot we are ready to start our first sequence in the App-V 5 sequencer. Another best practice is that you already installed the application before using a manual method, so you are familiar with the installation steps and required information. 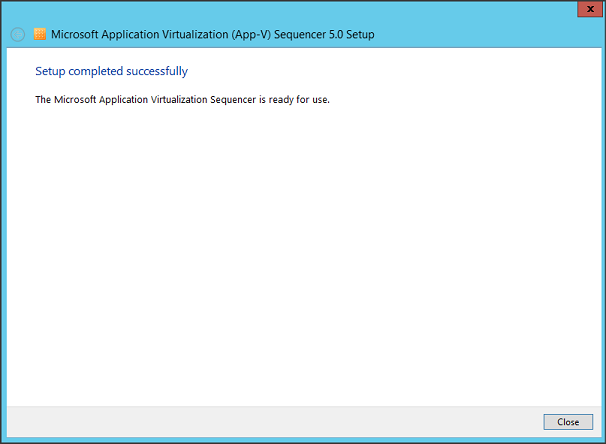 You start the App-V sequencer via the shortcut Microsoft Application Virtualization Sequencer. 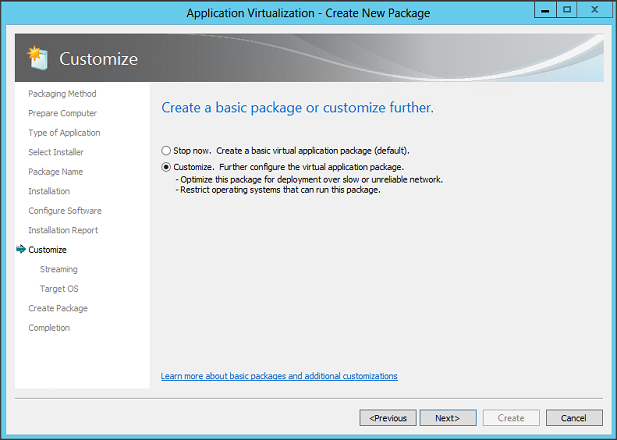 The sequence wizard starts with the question/decision to start with a new package or modify an already existing package. As stated in this article I will create a new package, so we are going to choose the option “Create a New Virtual Application Package”. After selecting to create a new package you need to define the package method. The first possibility is called Create Package (Default). With this option you execute all steps within the sequence wizard. The second possibility is to use a Package Accelerator. A Package Accelerator is a kind of recipe created by somebody else (for example a supplier or by the community). 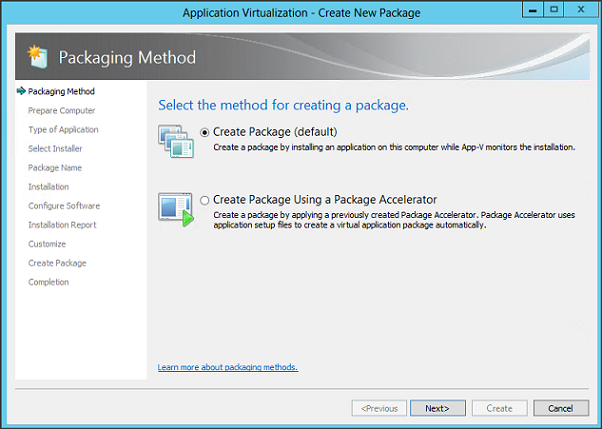 Using a Package Accelerator, all the steps are predefined and the package process is executed automatically. The success of the Package Accelerator is dependent on the suppliers that provide it and/or the community (including the reliability). For this article we will do the whole process on our own, so I use Create Package (Default). Figure 6: Selecting the method for creating a package. Next, the sequencer will check the machine and will provide feedback if there are conditions or processes available on the sequencer that can cause issues during sequencing. On my sequencer virtual machine nothing is detected, so it’s providing me a message that I’m ready to create the virtual package. Selecting the type of application is the next step. There are three options offered: Standard Application (Default), Add-On or Plug-in and Middleware. You will select Add-on/Plug-in when you want to create several virtualized packages and want them to connect via Connection Groups. Think of a Plug-in for Excel that will not be used by all users or has a frequent update interval. 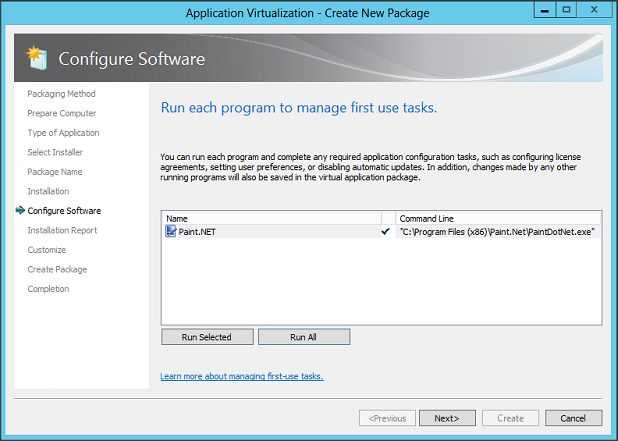 This option can also be used to virtualize add-ons for locally installed applications like Internet Explorer. Middleware will be selected if you want to sequence two or more applications in separated virtual packages that need to be connected via Connection Groups. With this option you will first sequence the application package of the software that will be used by the other software products. After that sequence you will continue creating the second Application Package. For a regular package without Connection Groups (so a single virtual package) you select the Standard Application (Default). For this article we are going to use that option. At the select installer window you really need to consider which option you would like to choose. If the application installation is run using one file, then using the option “Select the installer for the application” is the best choice. However when there are more files that need to be run I personally would choose the Perform a Custom installation that will give you more room to execute the installation exactly as you would like. In this article I will use ‘select the installer’ option to point the Paint.Net MSI. After selecting the installer file or deciding to use a custom installation you need to provide a package name and the primary virtual application directory. The package name will be used as the name displayed within App-V Management Console. The virtual application directory is the successor of the App-V (by default) Q drive. For those who used App-V before version 5 you need to install the application on a specific drive (by default Q). This is completely removed and the primary virtual application directory is being used for that. So, here you still provide where the application files will be installed during the recording phase. Figure 10: Providing Package Name and Primary Virtual Application Directory. Now you can execute the installation if you have chosen the custom installation in Figure 9 or when you select the installer option the installation will start automatically. Just follow the installation steps of the application, but take into account several best practices like disabling auto updates and install all application components. 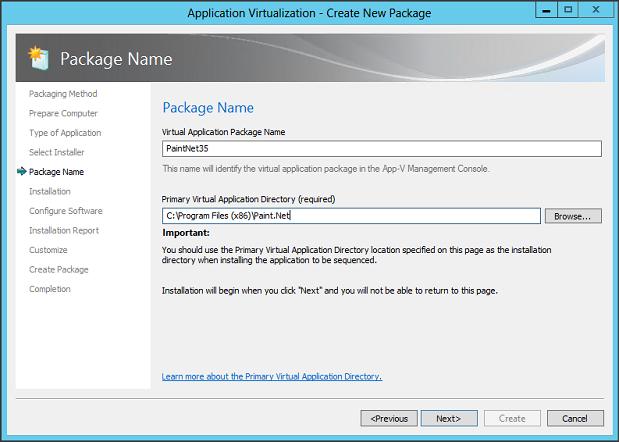 Also, MS recommends to install the application into the earlier provided primary virtual application directory (although there are several good discussions where it is stated that this is not necessary). 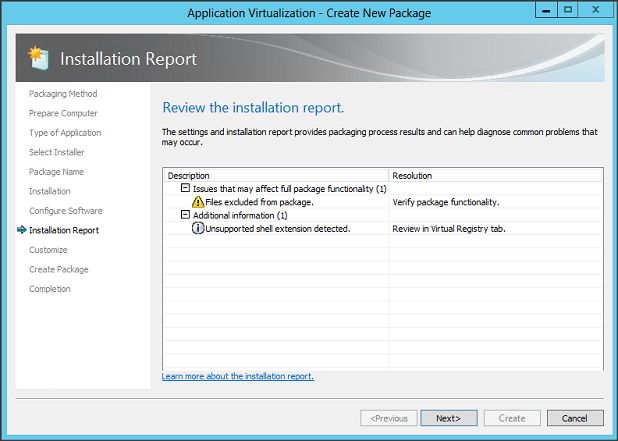 When you have installed the application you check the box 'I’m finished installing' and continue with the wizard steps. Figure 11: Finish the installation steps of the application by specifying I am finished installing. The system will capture the changes. Dependent on the size of the application and the package machine, this can take a while. When the capturing is done you can start the application once during the Configure Software phase. In this phase you can for example accept the license agreements or other first-run configuration settings. Figure 12: Start the application once to configure the first-run settings. The sequencer shows the installation report where warnings and possible issues are shown. Often this is about files placed in a location that is excluded in the recording process (for example the Temp folder). Open the message to check if you have to do some customization after the sequence process. 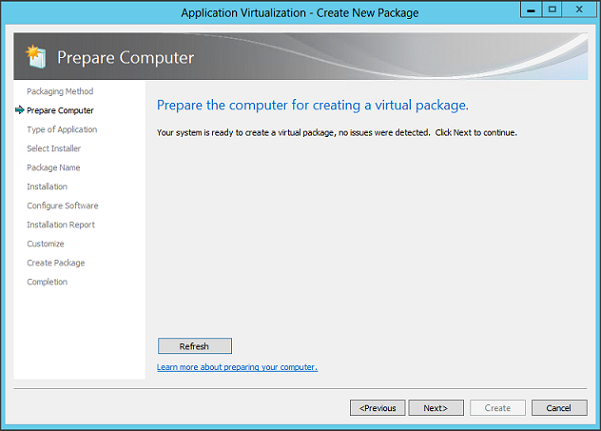 In essence the virtualize package is now ready to compile. This can be done by selecting Stop Now, create a basic virtual application package (default). Although this is the default, I advise to select Customize and have the possibility to go a bit more in-depth in the package. Figure 14: Create a basic package or customize further. In this first part I described the steps how to install the sequencer which is responsible for creating the virtualized packages. 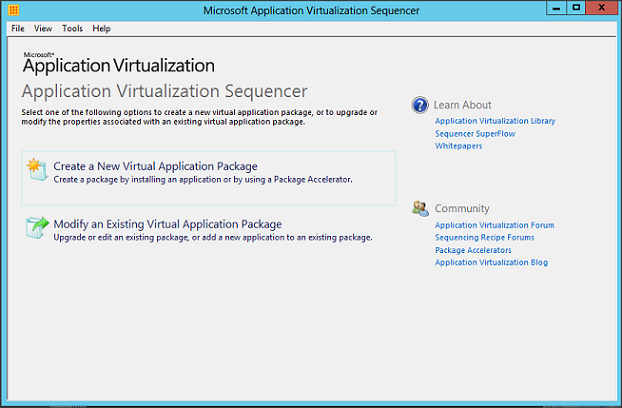 We continued with the steps to create a virtualized package with this sequencer. 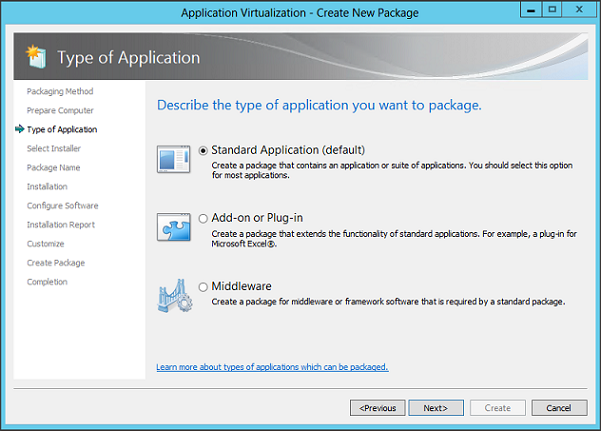 In the second part we will continue with the steps to create a virtualized application and the possibilities to update an application package.